Well it appears nothing is sacred! So it appears they do things a little different in Scandinavian. Someone has taken to desecrating, or in this case defecating at a local norwegian golf course. Is this just an aggravated golfer getting revenge after a poor round? Or is there more to this disturbing story. According to a story published by Rogalands Avis’ Frode Olsen (h/t Golf News Net), Stavanger Golf Club in Stavanger, Norway, has been attacked by an unknown, pants-dropping menace for the last decade. As the story goes, the club began finding feces in cups around the course in 2005. The bombing of said cups has since continued in earnest despite added security measures, including the installation of flood lights around some of the perpetrator’s preferred greens. Nothing definite is known about the monster behind these heinous movements, but there are some compelling theories. “We know it is a man because the poos are too massive to be from a woman,” groundskeeper Kenneth Tennfjord told Olsen. Tennfjord added that toilet paper is also sometimes left behind. Course officials note that the offender only strikes during the work week and leaves bicycle tracks on sections of the course. So when is CSI Norway getting involved? Can you imagine the episode? Anyway if you have any information that could lead to the capture of this individual, please come forward. 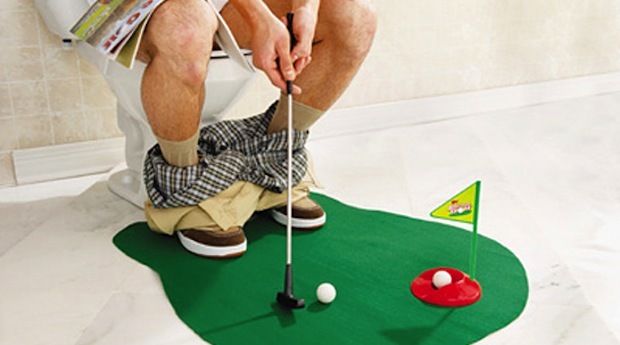 The team at GOLF DIE HARD can’t stand the thought of some poor golfer holing his putt, only to find some local menaces do do.